Stan Mikita was 78. He was the four-time Art Ross Trophy winner who played all of his 22 NHL seasons with the Chicago Blackhawks. He led the club to the 1961 Stanley Cup and is the Blackhawks' all-time leading scorer with 1,467 points. And don't forget his great cameo in the first Wayne's World flick!! a year or so back during the weekend festivities for the NHL All-Star game. 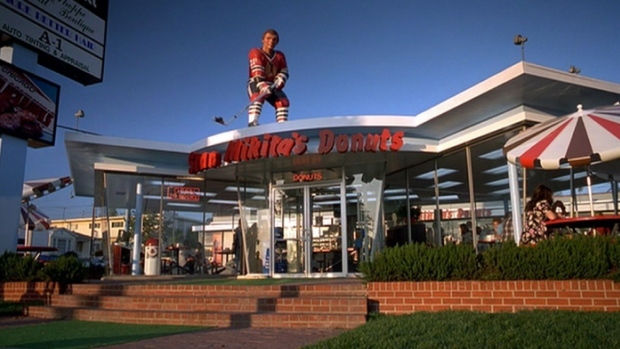 The pic of Stan Mikita's Donuts was a nod to his great Wayne's World cameo! truthfully, do I ever, really?!? Stan was the best Hawks player (even above Bobby Hull). Remember watching him in 60's/70's & was the 1st player to play with a helmet in NHL. Helmets appeared after the Ace Bailey–Eddie Shore incident on December 12, 1933, as a result of which Bailey almost died and Shore suffered a severe head injury. After that, Art Ross engineered a new helmet design and when the Boston Bruins took to the ice in a game against the Ottawa Senators, most of the players donned the new helmet. Most Bruins players didn't wear the helmet after the game, with the exception of Eddie Shore, who wore it the rest of his career. The innovator of the curved hockey stick. Rest in peace, Stan.